Returning Members, thank you so much! With your support, we ended 2016 with nearly 500 members, all of whom helped raise awareness of Cascadia, supported our chapters and projects, and allowed CascadiaNow! to continue to grow as a regional hub for place based action and support. This year, we've got lots of exciting things planned to try and make this a unique membership program, and some really awesome ways to be engaged and involved so that every person can be a part of this awesome and amazing movement. Returning members receive: A hard copy CascadiaNow! Membership Card, a one year member patch, a 10% store discount, a unique membership item, and a yearly annual report, plus other goodies. Please read below the membership levels for more information. Don't care about the swag? You will have the option for 100% of your gift go to CascadiaNow! 's mission of cultivating a resilient and inclusive Pacific Northwest community. Because all of our returning members already got a lot of the swag we did last year, we wanted to think up new ways that would make CascadiaNow! Membership unique, special and relevant for Cascadia supporters throughout the bio-region. We came up with the idea of doing awesome little perks throughout the year which help us build Cascadia community, educate or raise awareness for Cascadia, or provide resources for all our amazing street ambassadors out there who spread the word. Each of these perks will be unique, each quarter and each year, and we will hopefully be opening this up to our membership to help guide the direction and design for what you would like to see, and feel is important in a membership and organization. A hard copy CN! Membership card. Your member number from last year will still be good, and this year we will be hooking that in to provide a 10% discount in our store, and hopefully will grow that as we begin to build partnerships with independent businesses around Cascadia. It's not a bioregional passport yet... but we're getting there. An awesome one year CascadiaNow! Membership patch. For all of our founding members. We look forward to being able to provide really neat unique items for all of our earliest supporters. That will go out to all returning members. This will change each year, and include awesome art, or some other cool educational materials not found elsewhere. We'd also like to hook in special things that emerge from the movement, like a holiday calendar or other ideas. Posters, flyers, a map - don't hold us to this one yet, but this idea has us the most excited currently, as we would love to be sharing some type of cool items via email (don't worry, we're not gonna be spamming you). Right now we're working on a digital membership kit, which can be a series of digital files that goes out to members upon signing up (or would be mailed out to existing members), and in the future this can expand to have all sorts of educational materials and resources for helping spread the idea to family, friends and your community that just don't currently exist right now. What exactly are we doing with all this money that we're raising with the store, and through our memberships? We would actually love to show you! In the past year, we've started building a long lasting, sustainable network of ambassadors and chapters around the bioregion, and in June of last year we launched our fiscal sponsorship program which lets us serve as a non-profit umbrella for events, projects and groups with our tax status, and provide core services for organization working to improve the Northwest, or raise awareness of Cascadia. 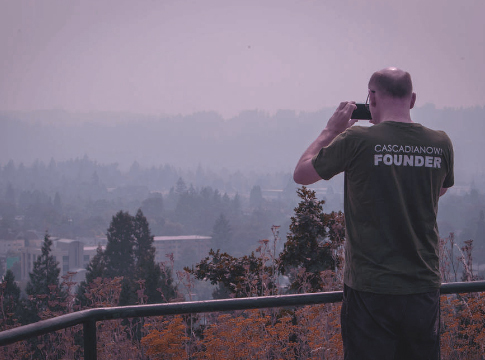 This year we are also offering both annual giving and a monthly membership, in the hope that this will make membership more accessible for those who love Cascadia. Monthly giving also helps us to better allocate our funding, plan for the year, and make sure that we continue to provide high quality services in a responsible manner. In short, we think you are awesome. You are the Cascadia movement, and we're super proud of everything that we, and you, have been doing over the past year. We can't wait to share it with you, and continue to grow this amazing idea and our Cascadia community. It is so cool to see all of the excitement and positive energy really building around Cascadia and more than anything, we really want to live up to that energy, and the underlying principles that Cascadia embodies. This is Cascadia, and you are the Cascadia movement! Thank you all so much! YOU make this movement happen. Your efforts keep our organization independent and supporter driven, and right now, 100% of our funding comes from passionate supporters like yourself, through our non-profit store, small gifts and memberships. CascadiaNow! is a diverse group of passionate people interested in protecting the things we find special, and helping build healthier communities here in the Pacific Northwest. Two years ago at this time, CascadiaNow had 1,600 likes on Facebook to more than 16,000 today. Interest and support for the idea and movement has exploded, and we want to be able to build an organization able to protect the amazing things we love about this region, and live up to those ideals and dreams. Each of us has that power, and this is where we start. Support from this campaign goes directly to helping projects, events and groups across the Pacific Northwest. As a fiscal sponsorship organization, we enable the movement of money from funders to Cascadia projects, ideas, organizations, and activities. And that's all there is to it. Join us! To CN! Chapters and Chapter Activities. To keep CN! independent and supporter-driven. To provide and create bioregional resources, services and opportunities. To sponsor/co-sponsor events that engage community members by sharing their passions and skills. Support projects, events and groups working to foster a strong and healthy bioregion.